In this photo taken by local photographer Marvin Cattoor, an adult male black bear crouches in a tree Sunday morning on Ranney Street. The bear also took refuge in a tree on Mack Lane, said Cattoor, who took several photos of the animal before it was euthanized by Colorado Parks and Wildlife officials. Colorado Parks and Wildlife officers euthanized an adult male black bear Sunday in Craig after attempts to tranquilize the animal failed, an agency spokesman said. “Our officers did not put this bear down for any other reason other than the fact that it was a tagged nuisance bear and it did not look like it was in any hurry to leave the city,” said Mike Porras, public information officer for Parks and Wildlife’s northwest region. The bear was reported Sunday morning to the Moffat County Public Safety Center, where the call was forwarded to Parks and Wildlife. The caller reported the animal was in the yard of a home near the intersection of Third Street and Mack Lane, Porras said. The animal, which probably was searching for food, was estimated to be between 8 and 10 years old and weighed roughly 300 pounds, “which is a fairly large bear for this time of year,” Porras said. 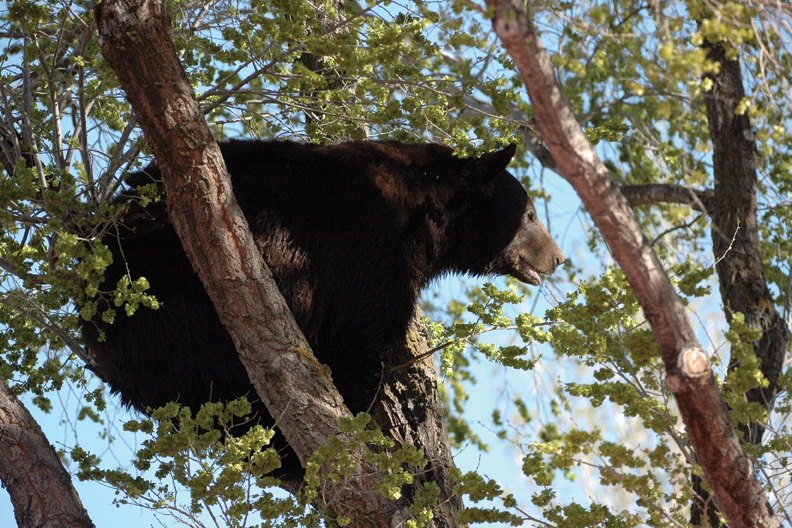 Parks and Wildlife officers found the bear in a tree when they came on the scene. “They tried to tranquilize it but for unknown reasons, the tranquilizer darts did not work,” Porras said. The bear then escaped into Woodbury Park, but not before leaving a “bear-sized hole” in Marvin and Robin Weible’s barbed-wire fence, she said. Robin, 53, spotted the bear at about 9 a.m. in her back yard, which borders Woodbury Park on the 1400 block of West Third Street. “It was pretty exciting,” she said. “That’s just not something you see every day, even living around here,” she said. From the park, the bear headed south of First Street. Attempts to herd it out of the area were unsuccessful. Wildlife officials euthanized the animal south of the Public Safety Center. Officers acted in accordance with a “two-strike” policy that allows them to euthanize bears that have been tagged for having human contact once before. He cautioned residents to be mindful of bears and avoid leaving food out for them. “It just speaks to the reasons that people need to remember to not provide human food to bears, whether it’s through trash or bird feeders or hand-feeding,” he said.